Seven breeds and several preperation methods to play with, not to mention COLOR! Projects for reenactment often have great focus. What sources do you have? What information doesn’t it provide? How to extrapolate reasonable solutions, and make acceptable justifications? Whose standard of reasonable and acceptable are you aspiring to? (1) Is it authentic enough? I’ve been chasing my tail in circles, ever more frustrated, and ever more unable to move forward. Time to get off the authenticity carousel. I have decided to step away from sourced-based reenactment-driven projects and just DO. 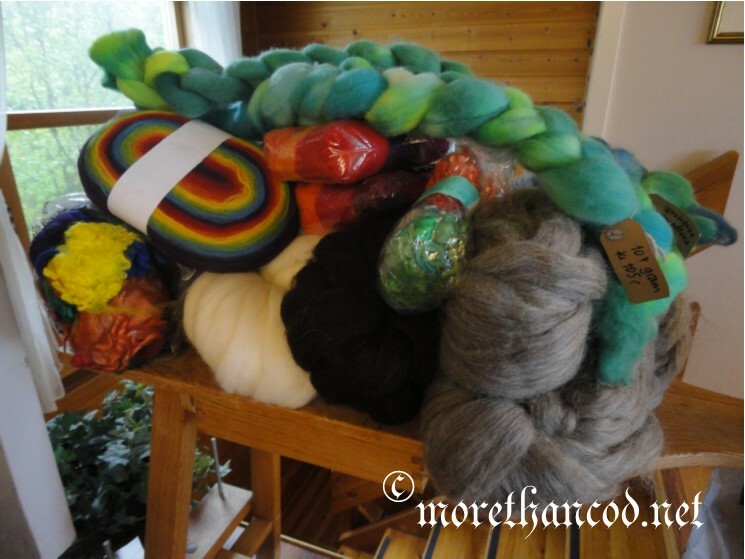 I am going to spin as many different qualities of yarn as I can, and experiment with as many different fiber sources as I can get my hands on. I am already playing with different ways of preparing wool for spinning, experiencing how they work in my Arctic climate. I will play with color and plying and all the infinite variables that will teach my hands how to mindfully create intentional results. I am going to weave. I will create cloth from the yarns I spin and from commercial fiber. I will explore the magical interaction of different drafts and setts (patterns and density), and how different fibers interact. I will explore how wet finishing affects the end result, and hopefully will be smart enough to test through sampling! I am going to sew clothing from my cloth and knit my yarn. Perfection will be in the satisfaction that I made it, and I will know what I have learned in the process. I can be intentional, working to achieve a specific effect, and I can change my mind if the project leads me down a different path. By changing from sharp focus with strict constraints, I am going to cast my gaze outward. I give myself permission to clear my mind, clear the boards, and explore. Through exploration, I hope to gain the handworking confidence I need to later reengage with the historically based projects I find so very fascinating. (1) I warmly recommend reading Anna Nørgaard’s thoughtful introduction to her chapter “Producing a hand-made reconstruction” in Medieval Garments Reconstructed. Fransen, Lilli, Anna Nørgaard and Else Østergård. Medieval Garments Reconstructed: Norse Clothing Patterns. Aarhus: Aarhus University Press, 2011. ISBN: 978-87-7934-298-9.